One of the best ways to de-clutter your home, or simply earn some extra cash, is to hold a yard sale (or garage sale). This consists of displaying items you no longer want or need in your front driveway/yard and allowing people to purchase items using cash. Our yard sale checklist template is an easy guide to help you organize, execute and wrap-up your sale for the best results. Start by downloading the checklist template located at the bottom of this page. The three columns in the Excel template consist of the tasks, a place for notes, and a column to mark off completed tasks. You can fill out the template on Excel, or print it and use it that way. Most yard sales are held in the mornings on weekends, as that’s when its coolest out and many people are available to go “yard-saling”. Prepare by collecting items within your home that you don’t use or need anymore – clothing, furniture, books, anything from small trinkets to tables. Clean-up the items and put them in a safe place until the day of the sale. Prepare by creating signs that advertise your sale, using stickers or signs for prices (IE: “All books $2), and having tables and boxes available to place items on. If you’re selling clothes, try to get a rack to hang the clothing. On the day of the sale, wake up early and set-up so you don’t miss the early-bird shoppers. Be friendly, offer water if you can, and be ready to bargain. Set your prices at something that you are happy with, but won’t mind receiving a dollar or two less from. Finally, anything left unsold, you can hold onto for another sale, try to sell items on Craigslist, or just donate it to charity for a tax credit. 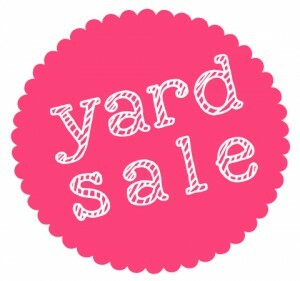 Download the Yard Sale Checklist Template here.